Mitt Romney spoke at the 40th annual Conservative Political Action Conference in National Harbor, Md., in March. The former presidential candidate has spent much of the past year focusing on his extended family. WASHINGTON — In the year since his White House dream came crashing down, Mitt Romney’s life has unfolded like pages from a family photo album. There are the many pictures posted online of his grandchildren, the shout-outs for his wife’s best-selling cookbook, a trip to Peru, and the purchase of a fifth house. He did not form a political action committee, and he did not try to play a major role in the Republican Party. He knew, according to his friends, that the Romney brand of Mr. Fix-it had been undermined by his own words and failed strategy. But as the calendar nears this week’s anniversary of his 2012 defeat, and a difficult year of reflection comes to a close, Romney is intent on re-emerging — slowly, carefully, in the calculated way of a cautious investor sensing an opportunity — but re-emerging nonetheless. In a Sunday interview with the Globe, Romney made some of his most pointed political remarks since losing the election, accusing President Obama of “dishonesty” in saying during the campaign that Americans could keep their health care plan under what has become known as Obamacare. The White House has acknowledged that some people with independent health coverage have received cancellation notices because their plans do not meet certain standards. The former Mass. governor said he felt compelled to speak out after the president traveled to Boston to proclaim his signature federal health care law. At the same time, Romney implicitly criticized his own party, saying that certain caucuses and state conventions — which in some cases have led to the nomination of Tea Party supporters — should be replaced with primaries that attract a wider swath of voters. Romney is hoping to influence the direction of the party by creating what he called a “small” political action committee that would allow him to raise money for candidates in the 2014 midterm elections. No one is suggesting that Romney would consider running again for the White House — two failed presidential bids dashed that dream — but his former aides hope that the public is considering him in a new light. “I think there is a national case for buyer’s remorse,” said Tom Rath, the New Hampshire political operative who worked closely with Romney in his last campaign. Over the past year, Romney has at times seemed to be without a defining cause or purpose to guide him beyond spending time with his five sons and their burgeoning families. It has been a slow walk back into the spotlight. At first, Romney went into analytical mode, meeting with former campaign aides to put together an internal review of why he lost. They put less blame on personal missteps, such as Romney’s comment that 47 percent of Americans are dependent on government, and more on missed strategic opportunities, such as failures to win over Hispanic voters and get out the Republican vote. Romney has spent much of the past year focusing on his extended family, which has grown this year by four grandchildren. In June, he drove to a car dealership in New Hampshire and traded in his 2005 red Mustang convertible for a 15-passenger Ford Econoline van. He is planning to take some of his grandchildren this summer on a tour to national parks in the American West, just as his father, George, did. He works in a personal office at Solamere Capital, a private capital firm founded by Romney’s oldest son, Tagg, on Boston’s fashionable Newbury Street. Romney is listed on the firm’s website as “executive partner group chairman,” a role in which he offers strategic advice and business connections. He has also provided financing for real estate ventures by several of his sons, who have been investing in apartment buildings, according to a source close to the family. 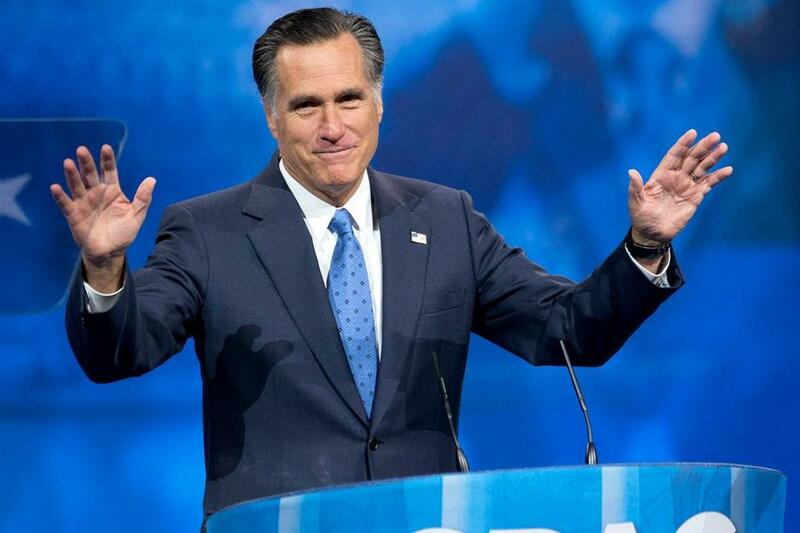 A few weeks after the election, Romney rejoined the Marriott International board of directors. Family members often post photos of him on Twitter and Instagram, showing the former presidential candidate with his hair disheveled, making homemade ice cream, reading bedtime stories, or playing Connect Four with his grandchildren. He has gone hiking in the California desert, and he has sat in a reclining lawn chair in Palm Springs, a newborn sleeping on his stomach. He has vacationed on Lake Huron in Ontario, and at the family home on Lake Winnipesaukee in New Hampshire. Last month, he went to remote areas of Peru to help a group called Charity Vision, which administers exams and screens for potential eye problems. One photo shows him, in a blue hospital gown and surgical mask, observing an operation. Another shows him helping a young girl with an eye exam. Romney said he and his wife, Ann, have also been involved in supporting the Center for Neurologic Disease at Brigham and Women’s Hospital. Instead of moving into one home — the White House — the Romneys have used their wealth to give them the option of living in five houses, each near their sons. After local appeals, the California Coastal Commission last month gave the Romneys approval to move forward on plans to tear down his 3,000-square-foot beachfront property in La Jolla and replace it with a home that is more than three times larger. The home will include the infamous four-car garage with an elevator that became fodder for criticism during the 2012 campaign. The Romneys have recently purchased property in Holladay, Utah, where they plan to tear down the existing house and build a 5,900-square-foot one. The family has also purchased a home in Park City, Utah, that had been listed for $8.9 million. The Romneys also have a condo in Belmont, Mass., and a vacation home in Wolfeboro, N.H.
Romney’s political engagement has been sporadic. He releases statements or grants interviews when it suits him. In June, he put together a conference in Park City that included bipartisan speakers, modeled after a campaign event a year earlier. It is difficult to gauge public opinion on Romney — and whether there’s any “buyer’s remorse” — because there have been no polls detailing opinions on the losing 2012 presidential candidate. Romney, who was pilloried during the GOP primaries by many Tea Party supporters, said the presidential nominating contest should be altered to diminish the influence of caucuses and encourage states to select candidates through broader primary elections. “I’m concerned that there’s an effort on the part of some to move toward caucuses or conventions to select nominees, and I think that’s a mistake,” Romney said. “I think we should reward those states that award delegates to the convention based upon primaries. Primaries are the place where you see whose message is connecting with the largest number of people,” he said. Romney’s plan would probably limit the strength of the Tea Party, whose activists have proved effective in caucuses, where they can rally their most ardent supporters. Romney said he was less concerned about diminishing the influence of Iowa, which holds strong to its tradition of having a caucus, than with other states moving in that direction. Romney said he is most focused with altering the presidential nominating contest, but he would also make his views known in some states that use caucuses and conventions to select Senate nominees. In Utah, for example, longtime Senator Bob Bennett was defeated during a convention by Tea Party-backed Mike Lee. While Romney is slowly easing back into a public role, many of his days are filled with quieter moments. A few weeks ago, Romney walked off a United flight by himself. He had promised his campaign assistant, Garrett Jackson, that he would attend a University of Mississippi football game with him. Romney wore an Ole Miss shirt that Jackson had given to him, and they sat in the stands, eating hot dogs and soaking it all in. The next morning, as Jackson drove Romney to the airport, his mind turned to their early campaign days together, before the entourage had grown, before the chartered plane, and before the devastating defeat. Matt Viser can be reached at maviser@globe.com. Michael Kranish can be reached atkranish@globe.com.